Who takes care of them when your not there??? If you consider the nature of a horse, it makes better sense. Jim’s reply is telling. It’s telling because it reflects our frame-of-reference which tends to be a bit different than the current traditional mode. A side note: Well, except for the miniature milking goats… but that was partly because they were such appetizing morsels for the local coyotes & bobcats, and the fact that they would work hard to get INTO the garden instead of utilizing the acres of pasture available to them. They were kept confined and when I had to make a choice between the Jersey Milk Cow or the Miniature Milking Goats, Bessie’s 2 gallons/day won out easy over 1 cup/day of goat milk. Bessie, the cow, came out way ahead in productivity compared to the goats. On top of behaving herself, by utilizing the pastures and leaving my garden alone, she provided the basis of some awesome pastured products: butter, cream, ice cream, whipped cream, and cheese. Let me tell you, it wasn’t a tough decision, choosing her over the goats. Made Jim much happier, too! But back to the horses. We believe in working toward decreasing one’s work load and working with nature as much as possible. So often we humans create a whole series of problems, by not understanding natural processes, that we then have to solve. Historically (one of my favorite words), i.e. for tens of hundreds of thousands of years, horses have managed quite well on their own. In the last 10,000 years we took them from ranging on the land, fending for themselves, and put them into tiny boxes. In those enclosed boxes they are exposed continually to noxious fumes (from the ammonia build up from their urine & the dust it combines with), and unable to travel the miles and miles that kept them in good shape, wearing their hooves down naturally. They tend to be fed diets that are too rich for their confined existence & minimal exercise. They would easily travel 20 miles just to get a drink, in nature, while grazing on grasses. Out in nature, If they are “spooked”, they run. They run for at least a quarter mile, and then will stop to look around to see if they are ok. They have survived by running first, then reassessing, as horses are prey animals… other things would hunt them down, so they only feel safe/OK within a herd, as there is safety in numbers. Humans often isolate them and keep them from interacting with each other, which increases their stress levels. A horse, give a choice, will choose to stand under a tree, in the rain, rather than go into an enclosure. We have seen that over and over. 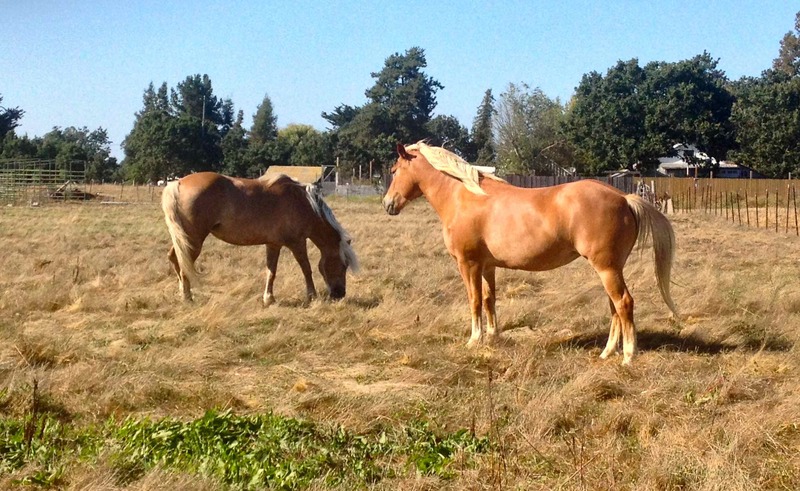 Horses & cows… will choose to stay outside, as a rule of thumb. It gives them the option to run, if they feel threatened, decreasing stress levels. They just need to have protection available to them, from wind and available shade. Trees work quite nicely, thank you kindly, as well a providing access to good ventilation. Their normal diet includes a broad range of forages (grasses not grains), including access to trees & shrubs (leaves) to supplement their diet for micro nutrients they need. We do supplement, when needed…. because we don’t have the acreage to fulfill their ranging needs. Ever notice that almost all horse enclosed pastures are stripped down to the dirt? It’s called over-grazed and basically strips the soil of it’s natural cover. We seem to think it’s suppose to be that way and that it’s OK. It most definitely IS NOT. Jim & I have learned a bit more, since being on that 65 acre ranch in 2005-09, about pasture/soil/land management. It’s all a learning curve and I have to say, we’ve been doing a heck of a lot of learning. 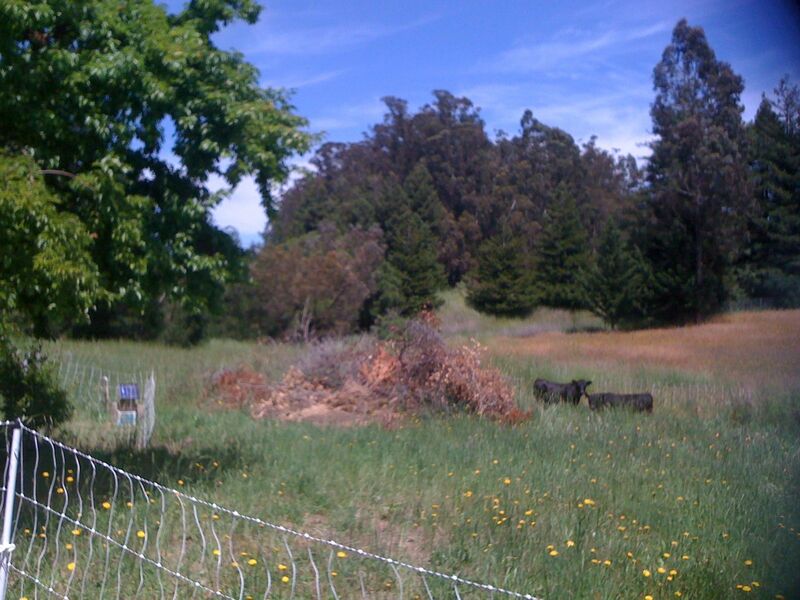 At present, we are beginning work on creating our “managed intensive grazing” setup (MIG) on the farm in Cotati. Livestock confined in a space will go eat what they like FIRST, then move on to the less appetizing, less appealing stuff (sounds about right!). But as soon as the forage they value begins to grow again (from the root’s reserve), they take that next bite of their favorite tasty morsel, which kills the plant. It had no time to rebuild the root’s reserves. When no reserves are left in its root system to regrow it’s solar panels (i.e. leaves), the plant dies. Over a relatively short period of time, the only thing left alive in the pasture will be the least desirable plants (to the horse). And in desperation, they may even eat the nasty stuff till nothing is left… and they are left standing around waiting for “man” to bring them food. With MIG, we will create small paddock areas where they will only have access to forage briefly. They will take a bite from everything available because they won’t have the leisure time to pick and choose. In a well designed system, you would have several species follow in order, as they all tend to eat different forages, so you get maximum use out of a pasture, without allowing it to be degraded. People say, well doesn’t that take a lot of time? Actually NO, not in comparison to the alternative, and it keeps the forage & soil & livestock in excellent condition, as an added benefit. It conserves water. Otherwise, we would have to buy off farm feed/forage, haul it in, store it, haul it out to the livestock, make sure they share, and deal with stripped bare soil/dust/mud. Much easier to just open an entrance to new pasture and have the cows/horses/chickens, etc., move themselves. They get to spend a day or so there, and then are offered a fresh paddock. They are kept from moving back to the prior used paddocks by a single electric tape line (that they highly respect! 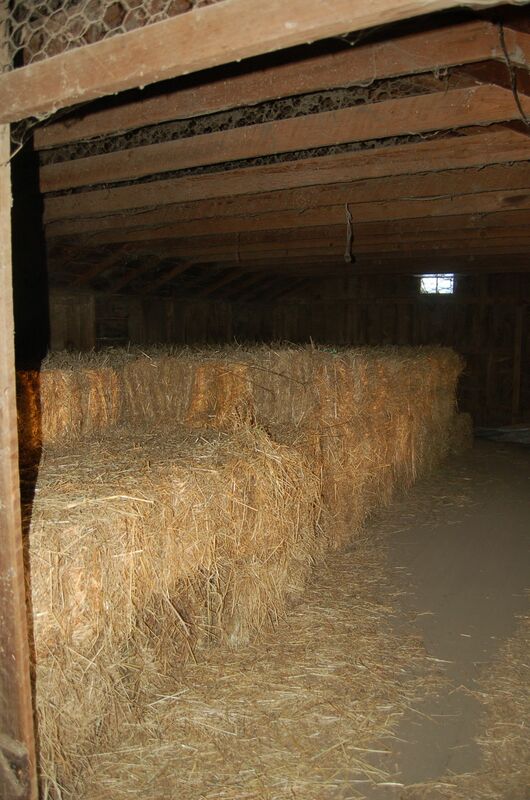 ), which allows the forages to regrow, protecting and maintaining healthy pastures. It’s so easy, even older kids and teenagers can do it… and us seniors! Currently we are not setup properly but we know where we are headed, on this farm property. Now that we have the well drilled, we need to get some irrigation in, rebuild the soil & forage quality & diversity, and create our MIG pattern. The neighbors cows ranged the land for years and have stripped all the quality forages from it. We have to do a bit of work to reverse that. 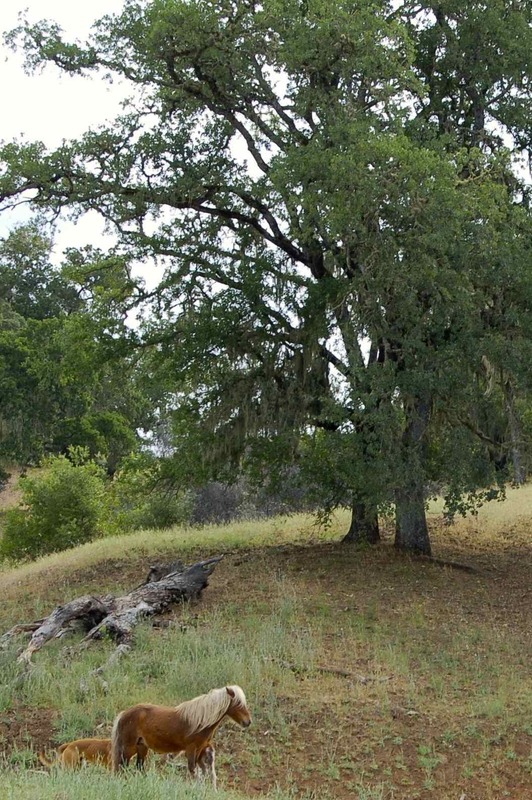 Presently the two horses are allowed to range freely on the acreage, utilizing the trees for shade/shelter as needed. They are building up a nice stockpile of fertilizer for us to use in rebuilding the nutrients in the soil (and spreading it around themselves for the most part)! But soon they will be introduced to MIG, and restricted from over grazing the forages we will have introduced. Right now they are stripping out the less desirable stuff, right before the California rains should appear, to facilitate the growth of the new pasture forages. In case this severe drought continues, we now have access to water to get the forages going. As we rebuild the quality of the soil (humus) and keep it covered with forage, it will naturally retain more water as the humus percentage increases, decreasing the need in the future for ongoing irrigation. RETURNING TO THE PAST, it’s easier by far! Our 2nd horse, Bella, came to us just recently. I swear she had not been in a free-ranging pasture for years. She immediately raced out to start grazing, and I don’t think she lifted her head from the ground, for more than 2 seconds, in the first few days she was on the farm. Lady & she bonded, but bonded with Bella’s head to the ground grazing! It was a pleasure to see her start to race around the pasture acreage as she stretched her “wings”. So, who takes care of the horses when we are not there? They do…. and they do a fine job.